This was our first experience with Golden Groundhog and we are so excited to say we LOVED them! 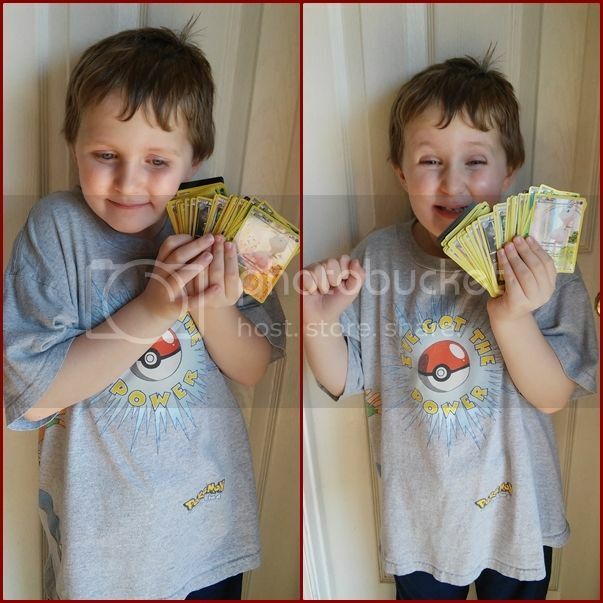 The set we ordered was from them on Amazon and it was called "50 Assorted Pokemon Card Pack Lot - No Duplication! With Foils, Rares, Random Pokemon Pin, Coin, and Storage Box or Tin! 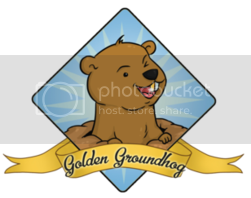 Includes 3 Custom Golden Groundhog Token Counters!" I wanted to make sure I specify exactly which one because they have TONS of different awesome lots to chose from. Our cards came in an awesome tin, which was originally the red Pokemon Legends of Hoenn Groudon-EX Collector Tin! Elijah was super glad because we weren't sure what we would get. This lot is basically the grab bag of Pokemon, you can get a lot of different options when you order this. Either a random tin or a box, one of many pins, some people get a coin, some don't and then you get 50 random cards. 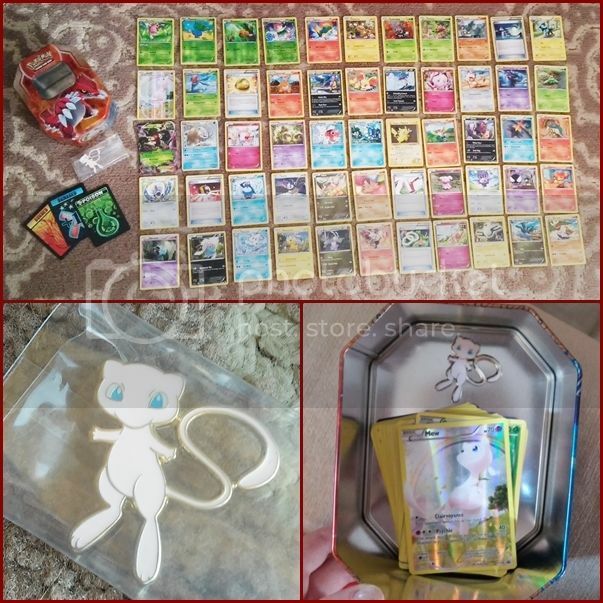 We were lucky enough to get one of the nicer tins, an officially licensed 2015 Mew pin, and 50 really awesome cards with foils and rares worth much more than the purchase price. Our set did not include the coin but with the cards we got it's not that big of a loss to us. They advertise no duplicates and there were none, all completely different cards. 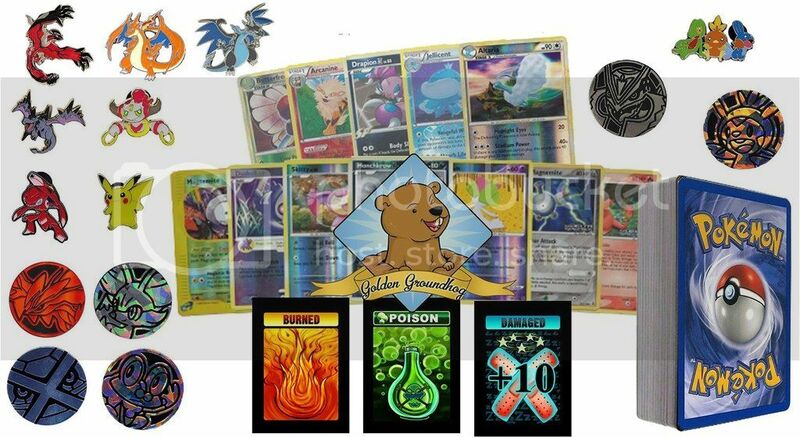 When I was in middle school Pokemon cards just were coming out and to get them you went to the store and bought these sets and would get doubles and triples of the same cards over and over just fighting to find that one card you were dying for. With Golden Groundhog sets you don't have that issue! There is also no energy cards in the lots, only actual Pokemon and trainer cards. We are super pleased with this order and would definitely buy this lot again. Ideas for Improvement: None, other than maybe labeling the amazon listing a little clearer how random the contents may actually be upon purchase will help alleviate some of the other customers confusion.